Dubare Elephant Camp Coorg is a project undertaken by forest department and jungle lodges and resorts. This camp has plenty of elephants which are trained under naturalists. A trained Naturalist is at hand to explain the various aspects of Elephant history, ecology and biology. The visitor can not only observe and learn but also participate in various activities involving Elephants. Laccessibility : The route from Bangalore is via Mysore, Kushalnagar, Gudde Hosur(4Km from Kushalnagar on BM Road), then a left turn towards Siddapura. About 15 kilometer on the Siddapur Main Road visitors would find a JLR Dubare Camp board. A left turn at the board and a kilometer drive would reach you to the bank of River Cauvery. 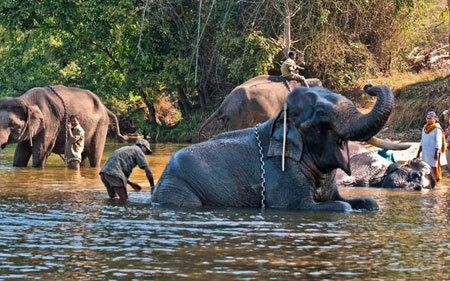 Cross the river by a boat and you would be at the Dubare Elephant Camp Coorg. Accomodation : This Camp has 10 luxurious cottages with attached bath. As this is a comparatively new camp there is no electricity here. However, electricity is provided through electric generator in the mornings and evenings. Dining : Apart from the luxurious cottages we also have a licensed bar to help our guests relax and share their experiences with each other at the end of the day. Cuisine Food at Dubare is homely and delicious. A buffet includes both vegetarian and non - vegetarian cuisine. We will be only too pleased to serve the indigenous food on special demand.